I am glad to have helped Dink NeSmith discover Wendell Berry. 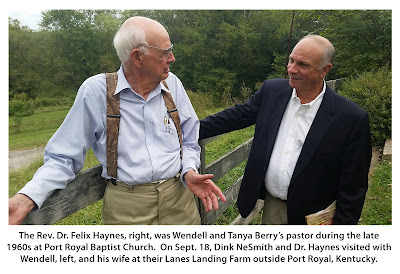 When I mentioned him to Dink at Hubert Howard’s birthday celebration, Dink plowed into the writings and information about Wendell Berry and his theological bent into environmental stewardship. 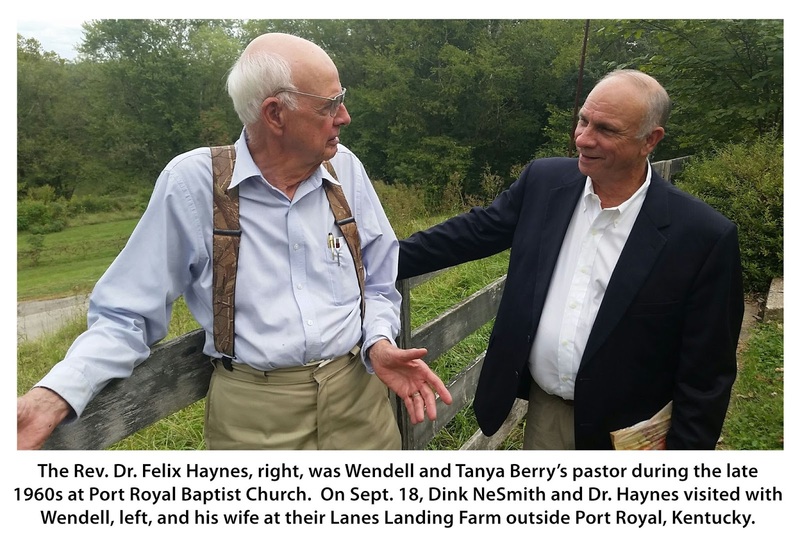 Dink’s telephone call came with his characteristic resolve: “I want to meet and talk to Wendell Berry.” He has a special and persuasive way of moving heaven and Earth to make good things happen. This quest eventuated in arrangements for that meeting on a beautiful September Sunday afternoon in the rolling hills of Kentucky near Port Royal. Since I served as pastor of the Port Royal Baptist Church during my seminary days in Louisville, Tanya Berry, Wendell’s wife, arranged for me to share memories from a biblical generation ago during the morning worship. Following the worship, we were treated to a potluck fellowship meal. The poignant encounters with friends and the walk down memory lane were enriching blessings of hallowed recollections. Two Georgia boys received red-carpet treatment in the Kentucky bluegrass country, and that will be forever etched in my mind and heart as a red-letter day! In the early afternoon we were off to the Berry home, nestled in an idyllic glen of mostly maple trees. The renovated, old two-story farmhouse stood at the foot of the hill, and from the front porch was a picturesque view of the Kentucky River, which ambled along the Berry farm. You could sense a bit of Daniel Boone’s spirit and a touch of Thoreau’s Walden. The ambiance seemed conducive to produce the powerful and life-shaping thoughts that have flowed from Wendell Berry’s pen. Inside the rustic elegance of this house were conspicuous shelves of books in every room, heart pine and walnut woods, no television, and an environment unspoiled, which provided a touch of heaven. We sat for a while around the round oak kitchen table with Tanya, catching the spirit of this devoted helpmeet and reflecting on the journey of this unique couple. Then, Wendell entered through the back kitchen door. The anticipated and longed-for encounter was about to occur. We received a warm and gracious welcome. Wendell’s demeanor was calm and gentle, and you could sense the presence of a seer, a prophetic aura steeped into the poet-author. As the ensuing conversation and dialogue unfolded, I knew we were on Holy Ground. The exchange was void of pious clichés and superficial, wasted words. The deep called out unto the deep. I watched and listened as two men of wise words shared insights on the stewardship of God’s good Earth. I sensed Rachel Carson was leaning over the balcony of heaven saying, “Amen. Say no to coal ash in Wayne County!” The two men, passionate and committed to ethical ecology, invaded each other’s souls with a depth of dialogue that fueled each of them to a deeper calling to help carry a message to protect God’s created world. Iron sharpens iron! And I had a front-row seat to see that happen! I was nurtured and inspired to do better with the message entrusted to me as a part of my calling. The stories and insight, shared with such fine articulation, could produce a myriad of informative essays. I have pondered and reflected on the essence of what occurred around that oak table. The conclusion I reached has to do with the power of community, real koinonia (common life)! Wendell had obviously read all the previous articles written by Dink and Janisse Ray. This conversation was about the intentional devotion to the betterment of community through solid communication. Then I saw the pulsating power of the prophet assert itself! The blue eyes of Berry sparkled, and the vocal intonations became very animated. He leaned toward NeSmith and said: “You are doing it with your newspaper and the excellent communication. You are doing it through events. … You are creating awareness of truths that matter. ... Keep stirring the conversation. ... Don’t stop! (He had earlier reminded Dink that David did slay Goliath.) 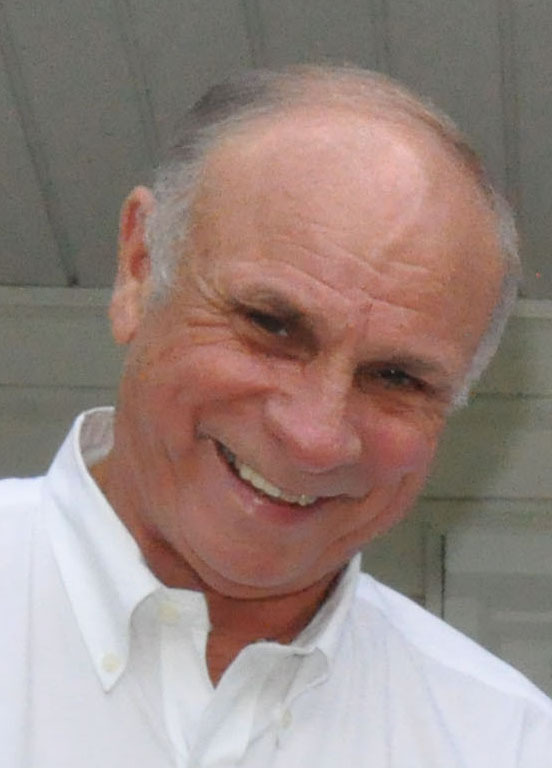 This is what matters …” He tacitly paid the newspaper man a high compliment. When the scripture calls us “to have dominion over the Earth,” the spotlight falls on man to make a better world. This is a call for people to manage ALL of God’s creation with greater responsibility. “No clever arrangement of bad eggs makes a good omelet.” The matter of how we handle coal ash—or ANYTHING else that harms our world—must be confronted, guarded, and guided by community. The goal is not capitalistic benefit; it is community welfare. The five most important words are these: IT IS UP TO YOU! We prepared to leave. I walked down the hill ahead of Dink. He was still snapping the camera and chatting with Tanya. When I started to get into the car, unaware to me, Wendell had followed. He looked at me and said: “This was really good … and I am sorry about the passing of your beloved Miriam ... and remember, you’ll get her back again—whole!” What a comforting benediction to me from this seer! God takes care of our loved ones! He wants us to take care of His world. And that is a very good deal!